RNA molecules participate in and regulate a vast array of cellular processes, and the scientific community is now entering a new era in which some aspect of RNA biologyas a tool, a therapeutic, a diagnostic, or part of a fundamental processis becoming increasingly important. But initiating RNA research can be intimidating, and without a thorough understanding of the challenges and complexities inherent in handling this fragile nucleic acid, forays into the RNA world can be quite frustrating. 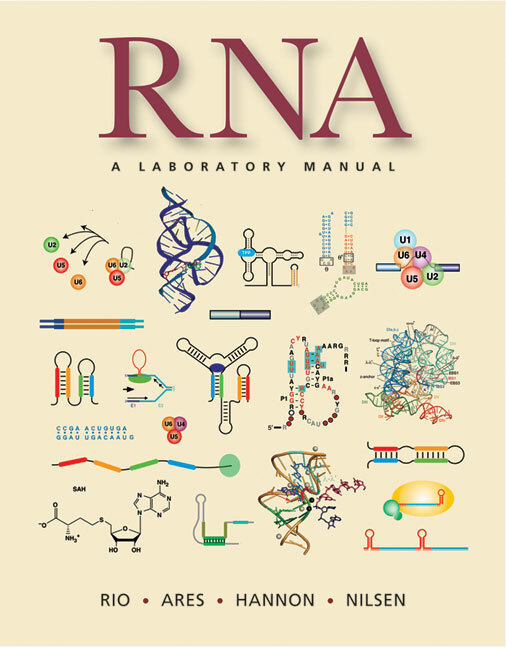 RNA: A Laboratory Manual provides a broad range of up-to-date techniques so that any investigator can confidently handle RNA and carry out meaningful experiments, from the most basic to the most sophisticated. Originating in four of the fields most prominent laboratories and written with novices as well as more advanced researchers in mind, this manual provides the necessary background and strategies for approaching any RNA investigation in addition to detailed step-by-step protocols and extensive tips and troubleshooting information. RNA: A Laboratory Manual will enable any researcher to approach a wide variety of RNA-related problems with confidence and a high expectation of success. Donald C. Rio is Professor of Molecular and Cell Biology at the University of California, Berkeley. His research has focused on nucleic acid biochemistry, nucleic acid–protein interactions, nucleic acid rearrangements, and genome-wide approaches to the role of RNA binding proteins in controlling alternative pre-mRNA splicing. Dr. Rio obtained his Ph.D. with Robert Tjian at the University of California, Berkeley and did postdoctoral work with Gerald Rubin. He was Assistant and Associate Professor at MIT and Associate Member of the Whitehead Institute for Biomedical Research, prior to moving to his current position. Manuel Ares, Jr. is Professor of Molecular, Cell & Developmental Biology at the University of California, Santa Cruz. He received a Ph.D. with Stephen H. Howell on the cell cycle of Chlamydomonas at UC San Diego (1982) and did postdoctoral work with Alan M. Weiner on snRNA transcription in HeLa cells at Yale. He joined the faculty at UC Santa Cruz in 1987 and has focused on snRNA processing, structure, and function in yeast and mammalian cells. He is currently President of the RNA Society. Gregory J. Hannon is Professor and Howard Hughes Medical Institute Investigator at Cold Spring Harbor Laboratory. He received his Ph.D. at Case Western Reserve University working with Tim Nilsen (1992) and then moved to Cold Spring Harbor Laboratory for postdoctoral studies with David Beach. A pioneering investigator in the field of RNA interference, his laboratory has characterized many of the major complexes for small interfering RNAs and microRNAs. His lab also investigates the role of small RNAs as oncogenes and tumor suppressors and the use of RNAi libraries to identify therapeutic targets for specific disease subtypes. Timothy W. Nilsen is Professor and Director of the Center for RNA Molecular Biology at Case Western Reserve University School of Medicine. He is also Professor of Biochemistry and of Medicine. After receiving a Ph.D. from the State University of New York at Albany working with Corrado Baglioni, he joined the faculty at CWRU (1982). His research has focused on RNA biology including the mechanism of action of interferon, the mechanism of SL-addition trans-splicing and mechanisms of regulation of alternative splicing. Currently, his laboratory is investigating the mechanism(s) of microRNA mediated gene regulation in animal cells and the structure and function of messenger ribonucleoprotiens. Dr. Nilsen became Editor in Chief of the journal RNA when it was founded in 1995 and still serves in that capacity. He is on the Editorial Board of Molecular and Cellular Biology and the Board of Reviewing Editors for Science.